Docking is Difficult, so is trying to escape a backwards planet who's only exports are methane and a type of plant that superficially resembles a pig in taste and a triffid in shape. Misha dreams of escaping the mud and mundane life to become an Elite pilot and live a life full of adventure. He also dreams of the day he will eventually pluck up enough courage to express his feelings for Phoebe, the beautiful customs officer of the trading station orbiting the planet. The sudden and unexpected death of Misha's favourite author provides ample opportunity to know Phoebe better, unfortunately it also throws them both into a system-wide conspiracy, complete with smuggling, international art thieves, multi-system corporations, canapés and exploding pigs. The author has managed to inject some of the ambience of the Elite Universe and yet still maintains his own voice while poking fun at the publishing industry. It's a novel with a warm, friendly tone that relaxes the reader and draws them into the crazy plot. There is a great deal of dark humour running through the book while the story engages well. The pace is comfortable and the protagonists like-able. The story has enough twists to keep the reader interested and the ending is highly rewarding. 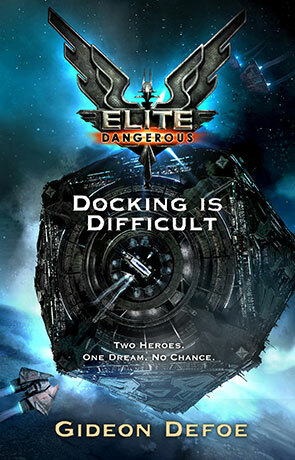 Docking is Difficult is a great addition to the Elite universe. It's got a great atmosphere and a flawed, hopeless protagonist. Above all though it has some great humour and a clever story with a great ending. Written on 24th November 2014 by Ant.